Sometimes the most difficult dental cases involve precise shade matching of a single front tooth. For example, the case below shows a central incisor that is discolored due to trauma. Many of us have accidentally hit or experienced trauma to a front tooth at a young age and now the tooth may appear yellow or discolored. If the nerve in the tooth is healthy and vital, the best treatment is to simply place a veneer or crown over the tooth to mask the discoloration. Matching a single veneer or crown to the adjacent tooth is extremely difficult. Many dentists will simply veneer both teeth to avoid difficulty of matching the shade. I try to be as conservative as possible with these cases and only treat what is necessary. I also have the benefit of having an in-office dental ceramist and we are able to closely match a patient’s natural tooth characteristics. Matching to the existing natural tooth structure requires careful evaluation of the healthy adjacent tooth. Notice the bluish translucency of the incisal edge and how the light reflects from the irregular surface texture of the enamel. 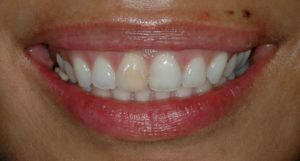 With our close collaboration here in the office, the dental ceramist and I are able to communicate, plan and fabricate porcelain veneers in Downtown Los Angeles or crowns that are unique to your natural tooth structure. 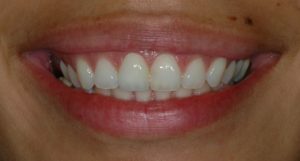 We are able to make modifications to achieve the exact match to your natural tooth. Dr. Adam Geach is a dentist in downtown Los Angeles who earned his DMD degree from the Harvard School of Dental Medicine and his Certificate in Prosthodontics from the University of Connecticut School of Dental Medicine. As a prosthodontist, he specializes in dental esthetics, implants, and reconstructive dentistry. If you have any questions, please contact him through his website.